If you’re someone who has always wanted to learn how to solder but were a bit reluctant to work with fire, then Soldering Made Simple by Joe Silvera may be the answer and the book for you. Joe will deftly show you how to learn soldering metals for jewelry making in a simple and straightforward way. He will alleviate any fears you may have by teaching you how to solder using small butane torches. This man is a true master. Soldering Made Simple has two rather comprehensive sections or parts for you to easily learn from. In Part I, you'll receive considerably more information than you'd expect to. You’ll get all the info about tools and materials required along with information on all soldering techniques. This is where you learn all about torches, how to use them and find your own comfort level with them. In Part One, you’ll find extra, basic metalsmithing techniques like filing, drilling, hammering, polishing and adding color to your metal. In addition to all of that, you'll also get information on how to shape metal using a neat little device called a dapping block. Part II brings you 12 soldering projects in varying complexity. Choose to learn one or all as your needs dictate. If you choose to complete all twelve projects, there’s just no doubt that you’ll have acquired all the soldering skills possible. On the other hand, you can decide just to stick with the most simple soldering like making the ear wires which is one of the beginning projects of the twelve. The great thing about Soldering Made Simple is that you can decide for yourself how deeply you want to get into soldering. This is not only an excellent project book for those wanting to finally learn how to solder their own handmade jewelry but it’s a superior reference book as well. In Summary, Mr. Silvera offers rare (and some of the best) training on just how to acquire the most excellent skill of soldering for jewelry making. A new book from the UK, Sarah Keay's Design and Make Jewellery Using Textile Techniques, is both an interesting and intriguing publication that any art jeweler or enthusiast will find most valuable. This book just won't disappoint you with all of its unusual potential and cool materials. 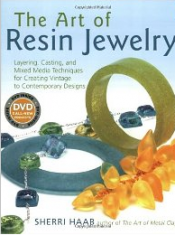 In the process of looking for some excellent wire jewelry DVD's, I came across this book for making resin jewelry WITH the DVD included. Seriously, it just doesn't get better than this for the price. 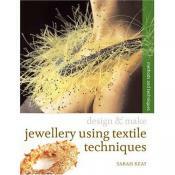 I do have this book which is excellent as are all of Sherri Haab's jewelry making products.